For jobs that demand fast performance, multi-display support, and the ruggedness to survive the harshest environments, InHand has developed the Hydra-F6 rugged tablet. Utilizing the multi-core Cortex-A9 i.MX 6 processor from Freescale and a revolutionary low power, sunlight-readable display, the Hydra-F6 was created for OEMs and system integrators requiring a quick solution for military, medical, or other industrial or commercial uses. The fully rugged tablet offers the versatility and portability of a consumer tablet with the durability and long production life of a MIL-SPEC mobile device. The InHand Hydra-F6 meets all specifications for temperature, fluid contaminates, solar radiation, fungus and immersion, while offering the full functionality expected from a compact mobile tablet. The tablet design features a 7” WSVGA, sunlight-readable display with automatic brightness control and display rotation. A resistive multi-touch Gorilla Glass touch panel, four programmable buttons, volume buttons and a power button make up the user interface. Features include: camera, microphone, stereo speaker output, haptic feedback and Qi wireless battery charging of the 37WHr 3.7V Lithium Polymer battery. The low-power design can run up to 8 hours on a full charge and weighs less than 25 ounces. The system’s expansion dock connector enables external connections via USB, DC power input, HDMI, SATA, and Gigabit Ethernet, and RS-232. 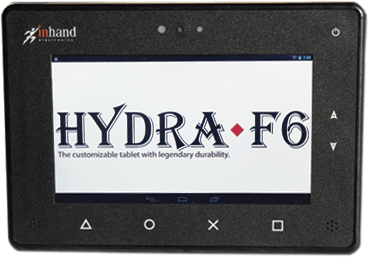 The Hydra-F6 is available as a commercial off-the-shelf (COTS) tablet or with InHand’s full range of design services to customize for application-specific needs. Options include alternative display sizes, camera resolutions, peripherals, docking solutions, operating systems, configuration lock-down, security features, and centralized asset tracking. Fully custom tablets may be private labeled with enclosures of alternate sizes, colors, shapes, buttons, external connections, materials, and design to meet project requirements. InHand offers over-the-air (OTA) updates via the InHand Device Manager (IDM), simplifying the task of maintaining device software in the field.